This handy little sock monkey bag will hang almost anywhere to keep those plastic bags handy for use. Keep it in the baby's room for used diapers, or in the laundry room to scoop the kitty litter box. Or near the door for when you're leaving to walk the dog. Or just keep it in your kitchen so you'll always be able to find a bag quickly. And the best part, is that this bag holder is so cute. 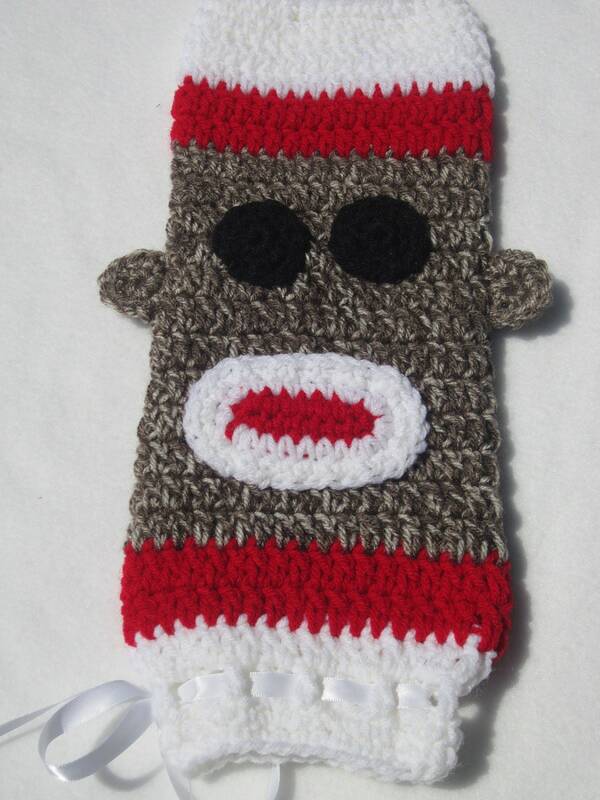 Crocheted from brown, red and white yarn, I've added a sock monkey face so that anywhere you hang this it will add to the fun of the room. This would make a great Christmas present for that person who has everything, or a special co-worker or teacher. This listing is made to order. Please allow me 2 or 3 days to complete your bag holder before mailing. This bag holder measures 14 inches long, not including the hanger and 5 1/2 inches across laying flat, not including his ears. It has a white ribbon at the bottom which you can loosen or tighten, depending on how easily you want to baggies to come out.